I’ve talked to you over the past year on many aspects of the biomedical research pipeline. But one issue, the plight of the early career researcher, has been front and center almost from the first day I joined NIH. Over a long period of time, NIH has made a concerted effort to make sure that faculty members in their early careers have a fair chance when they compete against more established investigators. If you enjoy history, a complete description of our programs starting in 1977 is available on our website. Over the past three decades, we’ve seen profound shifts in the average age at which a principal investigator receives their first R01. During the period from 1980 to 2001, the average age increased nearly 0.3 years per year. 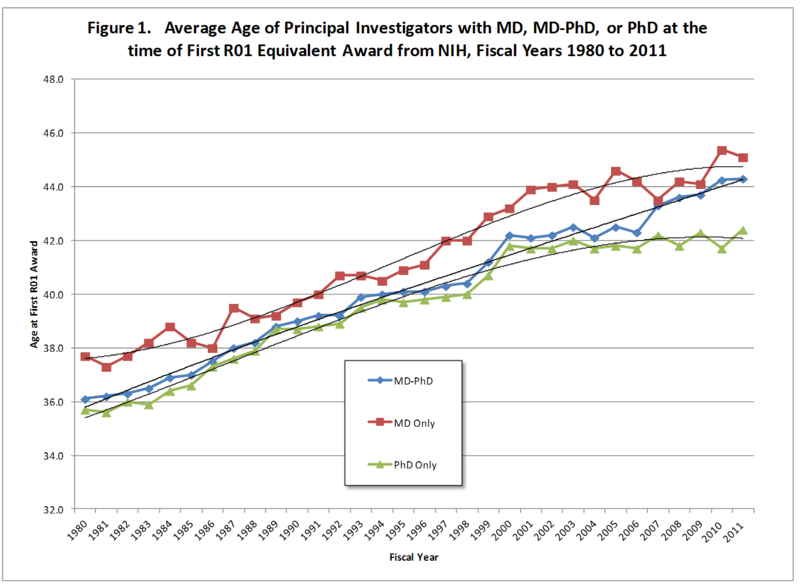 Since that time, the average age at first R01 award has leveled off near 42 for PhDs. It is higher for researchers with an MD or an MD/PhD. In more recent years, our new investigator (new to NIH funding) policies shifted to numerical targets, and you can see a substantial increase of new R01 investigators beginning in 2007. By 2010, the proportion of new investigators increased to approximately 30 percent of all competing R01s, replicating entry rates not seen since 1987. The imposition of numerical targets appears to have had little effect on the average age at which a new investigator receives their first award, however. In order to encourage earlier transition to independence, the NIH initiated the Early Stage Investigator policy for applications submitted for funding in fiscal year 2009. Early stage investigators are defined as being within ten years of completing their terminal degree or their medical residency. Our current policy requires that approximately half of all new investigators are early stage investigators, but, so far we’ve seen no decrease in the age at entry. Maybe it is too early to expect an impact. We’ve also made one additional change in the new investigator policy. Rather than using numerical targets, we’ve set targets based on success rates. The success rate for investigators submitting a new R01 application should be the same whether they are new or experienced investigators. Current policies related to new investigators are described on the Financial Operations webpage (note that some of the IC-specific policies are currently being updated for fiscal year 2012). We believe it is important to continually refresh the pool of talented scientists and to give them an opportunity to manage their own project while they are still relatively young. We also believe in evaluating the results of our efforts, so we are analyzing the outcomes of these the new investigator policies. For example, how successful are these new investigators after they get their first award and has that changed as we fund more of these researchers? So, as always, stay tuned. This entry was posted in blog, Rock Talk and tagged Biomedical Workforce by Sally Rockey. Bookmark the permalink. Currnet NIH policy does not appear to address the fundamental question of why younger investigators are not as competitive as they used to be. Rather, it distorts competition to achieve the desired policy outcome. However, this does not in fact alter the competitiveness of young investigators whatsoever. Therefore, I expect that current policy will do nothing to improve the future competitiveness of today’s younger ivestigators. Indeed, it may lessen it. As these now “successful” young investigators come up for competitive continuation the traits that contributed to their lack of prior competitiveness have not been identified or addressed and they can be expected to fail at higher rates that comparably aged investigators who were not provided such benefits. Because they are now older, the effect will be that the average age of successful funding would continue to increase. If the proposition that it is desirable to have higher success rates among younger investigators is valid (not much data on that), then what is needed is a means to increase competitiveness in young investigators. One way would be to fully understand what has lead to this increase in age at first award and to determine whether there is a way to increase competitiveness, for example through educational opportunity, remedial training, the creation of incentives to allow young investigators to advance their own competitiveness etc. Alternatively, funding policy could be applied in a way that specifically seeks to foster the skills that lead to success in competition. For example, a funding mechanism could be created that is specifically directed towards young investigators so that they compete against each other. Success is not the desired outcome. Excellence is. A mechanism to create smaller awards that are limited to younger investigators in which they compete with one another might assist in developing the skills required to be competitive. It would also assist in ensuring that we make our young scientists better competitors rather than simply give them a hand out at the expense of better work from older scientists. All this effort and attention. Out of order pickups….and all you’ve managed is to stop the increasing trend?? Seriously? No reversal? Look at the green line in Figure 2, 2004-present. The increase in age for first time awardees is also likely related to a reduced number of available independent positions, requiring extended or additional postdoctoral fellowships. The number of new positions has not kept pace with the rate at which young scientists are generated as each mentor produce several to tens of postdoctoral “offspring”. Perhaps being more stringent with regard to the number of Ph.D.s produced and proper guidance for those that possess the aptitude and willingness to pursue an academic career should be considered. Right now the emphasis on increasing or maintaining a certain level of new scientists seems out of place. Why should every effort be made to give a new investigator an advantage when they will soon be facing pay lines of less than 10 percent? Right now the model appears to be “let’s help establish the next generation of scientists, then we will pull the rug out from under them when they are mid-career scientists”. I am skeptical that such a system will ever be able to adjust training levels to a more sustainable level that matches the current economic realities of funding biological science in this country. This is so on the money. I think in some ways the hardest transition is not to first R01 (where the EIS categorization is of some help) but to first renewal when newer investigators are thrown to the sharks. The expectation that a junior researcher with one R01 can compete on a level playing field with a senior PI with 3-4 is just ludicrous, especially as some senior reviewers seem to take the view that a well-known senior PI should get funded even if they write a lousy grant because “they know what they are doing so will not waste the money” – I have seen this happen. The reality should be that senior PIs should be held to a higher standard than their junior colleagues. Finally, to say that a leveling off of age of first R01 is an improvement is ridiculous – we have to spend 10 to 12 years post-PhD to even have a shot at a successful grant, aand even that assumes that our own hard work and ideas are viewed as coming from us rather than our mentors (especially if we were recipients of training grants). The system is broken. At the very least, there should be an upper age limit on applications so that Faculty who should have retired 15 years ago are not taking funding away from junior PIs – maybe that way we wont have to wait until late middle age to have any chance at all! This site seems to be pure spin. the hardest transition is not to first R01 (where the EIS categorization is of some help) but to first renewal when newer investigators are thrown to the sharks. This is ridiculous. Those people have an interval of R01 level funding to generate data, publications, secure staff and to generally demonstrate accomplishment instead of the potential for accomplishment. They are enormously better off than newcomers, even with the ESI designation. Most of us in research and I think even at the NIH know the first renewal for new investigators is the real bottleneck. The impression I get is that if they fund enough early stage investigators a few will survive to get their renewal – survival of the fittest, luckiest or those with the best connections? This data is and should be horrifying. The trend line may be leveling off simply because by age 42, the “new” investigators are falling out of the applicant pool. Do the math. A 22 year old enters graduate school, graduates at age 28, completes a postdoc by age 33. Without a major grant, they would have be fired/denied tenure by age 39, if not sooner. Therefore, it is likely that the new policies have nothing to do with the observed trend. The leveling off is interesting. While it could be interpreted as improvement of a trend, I suspect that it really simply marks a natural ceiling. By the age of 42, if you are not funded you are not in the game. This says much about our training programs and the need to expedite the process. You are completely correct Peter Doris. If the kids these days want to be NIH funded Investigators they should compete fairly just like we did. Heck in my day if someone was still mucking around in a postdoc for more than 2 yrs, they weren’t going to make it. We should return to those days and only give appointments to those who can successfully compete within two years of the PhD. That will make it clear we only want the best. I really hope this is sarcasm. Heck in your day the payline was 35% with 3 submissions (and more if you changed the title). I too seriously hope your comments are ment to be sarcastic. excellent point and i would love to the see data plotted against historic paylines. e.g., in 2000 NCI’s payline was 22%tile– today 7%tile- what was the payline 20 years ago? It may be worthwhile to look at the data concerning R29 mechanisms that allowed early stage investigators to compete in a separate pool. Based on the data, when this grant mechanism was terminated few years ago, it was evident that the mechanism was not very successful (because less than 15% investigators were able to successfully compete for an R01 award subsequently). Any thoughts? Data is never horrifying. Only the conclusions that lead from it can be horrifying. Do you reach horrifying conclusions from this data? If so, would you advance the discussion by expressing your conclusions and the thoughts that lead from the data to them? I’d be very curious to see the data for K awards. The data shown above is interesting and coupled with Dr. Rockey’s more recent posts, here http://nexus.od.nih.gov/all/2012/02/13/age-distribution-of-nih-principal-investigators-and-medical-school-faculty/, suggest to me that the NIH has a large-scale challenge on their hands. If left unaddressed, may result in a crisis-like phenomena for the biomedical sciences. One of the primary challenges that the NIH faces is how to convert those bright young post-doctoral fellows into successful PIs that help to uncover powerful new technologies and mechanisms that will ultimate lead to better therapies and/or cures for diseases that negatively impact human health. This topic has recently been discussed, wonderfully, in a commentary published in Nature, here: http://www.nature.com/news/2011/110302/full/471007a.html. I recently attended a Friday evening meeting at my institution, whereby a God-father of a highly interdisciplinary biomedical field lectured to an audience that included post-docs., graduate- and medical- students, as well as a diverse faculty. He showed a very interesting figure that will be published in his book chapter, soon (of which I plan to post that data here when it becomes available). 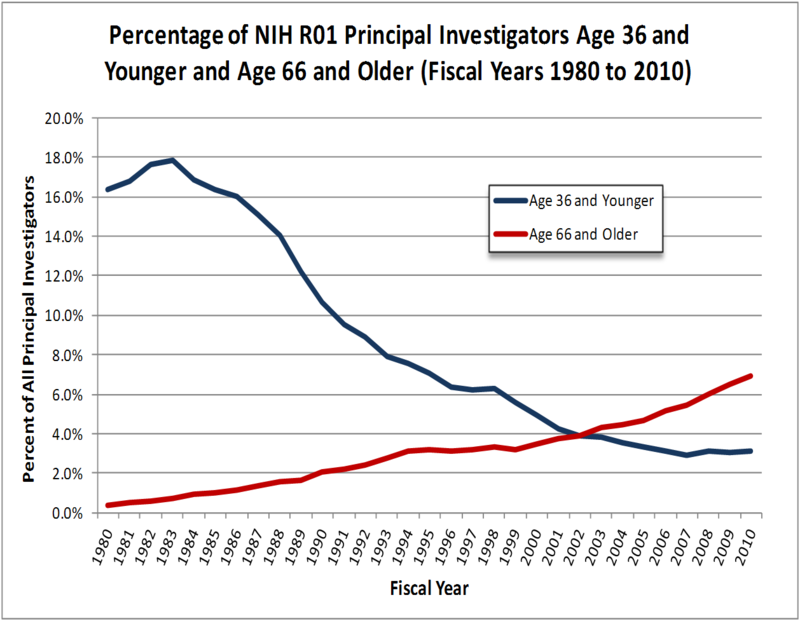 The figure he presented demonstrated that in 1980, co-incidentally when >16% of NIH-funded PIs were <36 years of age and younger (http://nexus.od.nih.gov/all/wp-content/uploads/2012/02/age-of-R01-investigators.png), the ‘quality’ of publications in the field under discussion (based on the actual impact of translating the basic science to bedside therapeutics) was high. This was associated with a low level of publications in this area, yet published in very prestigious, high-impact journals. In contrast, when he showed the data for 2010, a time-frame whereby ~3% of NIH-funded PIs were <36 years of age or younger, there was an explosion of articles in the field, yet the number of publications that actually had ‘impact’, was the exact same. Until NIH changes its policies of promoting quantity over quality, it will not matter how they support the younger generation. The younger generation is now being raised by an increasingly older cohort that understands to maintain or increase their funding status, publishing as much as possible is required, regardless of the quality. This policy will leave a lasting legacy of brainless science and pointless investigation and is a waste of taxpayer-funded research. ‘Experienced PI’, what world do you live in? Yes, if NIH paylines were still at the comfortable nearly 30% that they were when you may have ‘grown up’ in the field, or of the number of Ph.D. awarded : faculty positi0ns available ratio was what is used to be in your day, then I would potentially support your heartless and judgmental stance. BUT, things have changed dramatically, not just in science, but in our global economy and as a result, in our very societal structure (for example, I would love to know how much REAL time you actually spent taking care of your home and kids (if you even had any)). Today, this IS the reality of most young and mid-level scientists—we are often dual-career couples who participate equally in home/childcare responsibilities, and are simultaneously facing single-digit NIH paylines and such a glutted job market that there are about 300+ applicants for every piddly little faculty position that is posted. So, unless people like you are willing to limit the amount of NIH grants that you receive (say, no more than 2 active R01s at a time or a center plus 1 R01), you will essentially mandate the systematic genocide of the mid-level scientist that is in the pipeline. Ian IS correct—the transition to R01 renewal is not only unprotected (there are no NIH programs to favor our apps or to award them with more generous percentile cut-offs like the new investigators), but the most likely place where massive hemorrhaging from the pipeline will take place. What is the use of supporting new and early-stage investigators is 5 years alter, you will just turn your back on us and let us flow out of the field???????? This is well said. When established investigators have RO1s, it is ridiculous. How can you justify 8 grants f your total % is only 100? When a new investigator submits a grant, 1ith 10% time, we ridiculed at the study section. These established investigators survive by haveing good postdocs. There are instances where the postdocs do not get good recommendation from these people! NIH should limit the number actve grants to 2. If NIH does this, then may be then the best new investigator will survive. Bring back the R29 and award incentive grants to new investigators who publish in high impact journals. The implications of this policy are so obviously bad for senior investigators I don’t understand why no one has pointed it out in obvious terms…. To make the argument simple, let’s say new investigators get a new grant at 40. Thus, established investigators are those aged about 45+. Let’s assume a career until 65 – a 20 year established investigator period. 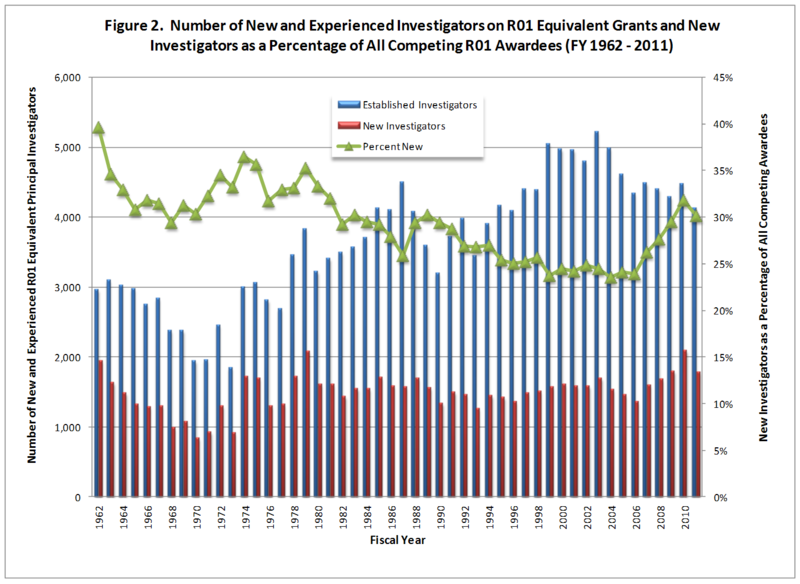 New investigators are getting about 1/3rd of new grants, but only cover about 20% of a career (5 years out of 25). On top of this, senior investigators typically have established more lines of research and can therefore (on average) manage more grant funds easier and more efficiently. So, the effect is to force out mid- and late-career investigators. New investigators are in for a BIG crash. This is a bubble, pure and simple. What is the point of funding a lab for 5 years and then pulling out the rug after tenure?! NIH administration has become as bad as our congressional leaders – just kick the can down the road and hope it gets better. The fundamental problem here is the basic economic law of supply and demand. Either you increase the funds in the pool, or you decrease the number of trainees. The system is unsustainable. The NIH has embarked on a path to remove new investigators form the competition of established investigators. Maybe they don’t realize it. If a young investigator applies for a grant and the first revision is not funded, they are added to a TSA type list of applicants needing extra screening. The screening is largely automated and the result is that these applicants (>8o% of applicants) must write a grant in a new research area using new techniques and preparations. This new, unscientific screen, appears to last for the lifetime of the investigator. An NIH guideline for what is a “sufficiently different” grant says by example that an applicant unfunded for work on a transgenic mouse should change preparations to yeast. A new investigator is generally trained in a specific area so when the NIH text algorithm says the new application is says too much like the previous one (read common words) the applicant must learn a new field with different words and then do some experiments to generate preliminary data to show that they are competent in the new field and then write a new application and wait six months to see if it was sufficiently different, and then if they are lucky they might get it reviewed with >80% chance of failure. If it is scientifically reviewed and not funded they then are added to the TSA type list for any new application to be checked against two previous thought streams.Why might a competant new applicant look for some other kind of job. All that effort was in tghe name of saving a reviewer from having to examine a third or fourth revision. It takes a competant reviewer only a couple hours to compare a new revision to a previous application. It takes an applicant at least six months to learn a new field and write a thought out application. It is rude of the NIH to subject an applicant to that disparity. has the NIH checked the accuracy of grant differences by running funded grants from the same lab through the same algorithms? Are we positive that no one has more than one funded grant on a similar topic? If the NIH has the data, the applicants should should see it so they can look at the database and see how to modify their proposals to be like funded ones. At minimum the NIH should have a preproposal system so that an applicant can submit specific aims and an abstract and get an opinion that the changes are adequate to guarantee a scientific review before they take the time do write a new application and do the preliminary (unfunded) experiments. It is a rare personality that will stay in a grantee position when treated so rudely. We all know that Nobel prizes (read significant new ideas) went to investigators whose key work took place as young investigators. If the NIH wants to keep sending their money to traditionally funded geezers, they should expect no new ideas and the tiny drug pipeline suggests they have succeeded. All this focus on new investigators is misplaced. There is no reason to artificially increase the pool of academic researchers into a system that is unsustainable. The right number will be able to get through on their own without special favors. This just takes resources away from other investigators that already have significant investment by NIH in model systems and results. NIH is wasting two pots of money. One on new investigators that will not be able to compete later and all the past investment spent on established investigators that will be pushed out to make room. The review should be equal for all. Some new investigators will get in some old will be pushed out but it will be on merit not because of some artificial quota set up by NIH. What is the goal of NIH? To reduce the age of first grant? To improve the diversity and energy of new research? To increase the likelihood of success for early career scientists? If we want to change something other than a metric, there needs to be a paradigm shift that includes both NIH and the universities. I’ve seen multi-million dollar buildings justified with the belief that the new research space will be filled with PIs who will bring in enough money to cover their labs, their salaries, their research assistants and the indirects to pay off the loans for the building. As long as universities look at PIs as money-generating mechanisms, the university will focus on recruiting only PIs with funding. I think it is terribly important to define the purpose of NIH funding. Is it to advance biomedical knowledge and support innovation or to facilitate career development? If it is former then I fail to see why demographics should be of any concern. If it is the later then the NIH should come up with a two or three tiered system to accomplish its goal. Please define what is the central purpose????? I’d be interested to see this data split by gender. In the early years that some appear to envy, the average startup package for a new investigator was probably 10-20 times smaller than today, requiring quick success at the R01 game for continuation of a research career. Perhaps one of the factors reducing the competitiveness of today’s early investigators is the level of support they become accustomed to prior to having to compete on their own merits. I fail to understand the goal of giving funding preference to “new investigators”. A consequence of this is denying funding to established investigators, no matter how good or important their research is in order to fund “new investigators” no matter how inferior their research is. The role of NIH should be to fund the research that is most likely to result in improved health. Developing young investigators capable of directing such research should be left to the Universities. If NIH deems it desirable to contribute to the development of new investigators, this would be better accomplished by establishing an NIH-sponsored mentoring program than by simply funding proposals based on the age or experience of applicants. I agree with the earlier comment that if preference is given to new applicants, in the long term this will be counterproductive in developing a new generation of scientists. Younger investigators will see their older colleagues locked out of funding after years of investment and will conclude that if they stay in the field, they will eventually encounter to same fate. I have seen many graduate students and postdocs decide to leave the field because they see the struggles their mentors have in maintaining research funding – i.e. having the rug pulled out from under them after building up a research program. I think you are alluding to what is really the root cause for the lack of young investigators. The best and the brightest and too good and too bright to suffer a career in academia. Those that do enter the lair aren’t given proper mentoring because the senior folks are too busy re-writing their projects to give them a shiny luster. The NIH programs are neither fair nor foul…they are the shifting of chairs on the titanic. NIH presides over the distribution of public funds in biomedical research that should benef the public. Therefore, independently on the age and the status of an applicant, the NIH should fund only the innovative research, the one that creates new values. In my opinion, however, NIH has a poorly utilized channel of influence that may greatly help in supporting the next generation of scientists. This channel is the cumulative administrative costs received by an institution from NIH. I think that organizations must use a significant fraction of this huge asset to support young scientists in a verifiable and transparent manner by creating supportive conditions for their scientific development rather than spending for additional compensation of bureaucracy and organization’s establishment. (These articles of expenditure should be linked entirely to the intellectual property-based revenue, which of course depends on the intellectual activities of the faculty and young postdocs). To ensure that it works, the NIH control mechanism over this expenditure by an organization should probably include a feedback from the junior faculty, not only the statistics of successful new grants received. To you, established investigators, you had it much easier, and now that you are established, you do not want to let go of your funding status and the privileges it affords you. You are selfish, pompous, and increasingly senile. You are convinced you are the only ones with good ideas, but the reality is you are spending so much time chasing funding to maintain your little empires, that it has been a long time since you actually did any real scientific work. YOU are the problem. Why not retire when it is your time? Why not become emeritus and spend your time mentoring young faculty? How much is enough for you? Why do you have to run empires until you croak? The structure of NIH is an inherent conflict between policy makers and the established reviewers. If it were left to them, the established reviewers would get all the funding. Policy makers are trying to control this to ensure that science has a future beyond the biological age of the most spoiled, most rotten, most selfish generation there is on the planet – the Babyboomers. Let’s examine some of the ways by which the “experienced” fight the policies and undermine the efforts for innovation. The established ones are usually the ones on the study sections. A young investigator has a bunch of new ideas and a desire to pursue them, but has little to no preliminary data. The established ones say “hmm, interesting idea, but here is how it can fail. So, get back to us with more preliminary data.” By the time you resubmit, you may or may not have that much more to show, then they shoot you down and it is over. Even when policy makers tell them to concentrate on the quality of the researcher and the potential impact of the idea and de-emphasize approach, the ExPIs IGNORE the official policy and nail the new idea on the approach. Of course the approach will be weaker – the research is not done yet! Meanwhile, what is it that these “experienced PIs” do to compete “fairly”. They ROUTINELY misappropriate funds from one grant to get preliminary data for another. When they are continuously funded, they spend half of an old one to get a new one half done, which by the way is ILLEGAL. Then they put in the new proposal with lots of preliminary data. No wonder the approach is excellent – the work is already almost done! The ExPIs even recognize this freely behind closed doors. It is the big joke of NIH and current academia. How is this fair? So, all of you “fair- competition” posters, are you intellectually dishonest or just horribly misinformed? If you are ExPIs, then you know how you play the game. It is in the best interest of the taxpayer to get good ideas tried out in high risk/high reward settings. This pervasive incrementalism and poor quality of science and stupendous number of pointless papers are all consequence of the greed and ego of established PIs, who have managed to pervert the system in such a way that it is now both grossly inefficient and unsustainable. If you want to do research, there is no reason to have more than maybe two R01’s, because that is all that one can manage WHILE remaining actively participating in the research. The taxpayer has no benefit in funding empires of paperpushers who are maintained by diligent and exploited postdocs. Our system is becoming more and more like Europe, where it is all about ego and politics, instead of science. While they do have less funding as a whole, they produce disproportionately less science exactly because of the perversity of the hierarchic system they have produced. That is where we are headed as well. wow… i was essentially going to write a comment just like this one, but i can save my time and click thumbs up. Baby-boomer senior scientists are no different than the population at large: they will demand their “entitlements” even as their productivity wanes… Gen X scientists are screwed…. Gen Y will fair better.. This might be off topic, but I am a young (mid-30’s) unfunded MD/PhD still in residency. I do research on my own time, using borrowed resources, and I hustle for lab space. For me, the issue isn’t about funding. The thing that I wish to ask of everyone is this — Please get out of my way! Please, the departmental research committee, your bureaucracy is stifling. Please get out of my way. To the IRB, you take 3 months to approve a simple retrospective study, please get out of my way. To the technology transfer office, you claim ownership of my own discoveries that I made on my own time and then ask me to pay you to license them back from you, please get out of my way. To my program director, unsupportive of my research, pushing clinical duties on me and making me use my post-call days for research time, please get out of my way. To the FDA, you bog us down with regulations, so much so we have to hire expensive consultants to even have a hope of translating any research to the bedside. The NIH, you are not in my way. That is good. Please keep it that way. Hi, This is an old post but I came across it in trying to figure out NIH funding for new/ young investigators for a disease affecting a family member. I wanted to address Moonbeam’s comment March 2012. A decade ago, I was a young MD with a Master’s degree in stats who was interested in staying in academic medicine and was offered tenure-track positions at two large well-known public universities. But ultimately, I decided to turn both down because I had three other offers to choose from from large multispecialty medical groups. A factor in my decision was the uncertainty of obtaining NIH or other funding; I knew a number of good people who had had numerous NIH applications turned down and some were unable to obtain tenure after several years. On average, I knew that academic medical docs made less than in other settings and that I could deal with but what I could not stand was the uncertainty whether I would be able to find funding from year-to-year and the possibility of not obtaining tenure after working at one place for a decade. Thus, I jumped ship. There are things I miss about academia (I had a supportive department chair and research group I was a part of) but the setting I work in not only pays well with great benefits but also engages in the type of research I enjoy and has opportunities to teach different types and levels of students. Because it is a national group, I don’t deal much with the business aspects of medicine much as an individual and I still have thousands of docs to network with should I have a question. It’s as close to academia as one can get without being in academic medicine. In addition, unless I truly mess up or the medical group goes under, the path to partnership is pretty much assured. If NIH wants to help attract and keep people like me, they need to make the environment more attractive, especially when we have competing offers. I recognize some of the problems (like poor funding of medical research in general) are not ones NIH has much control over but do what you can within your sphere of influence.